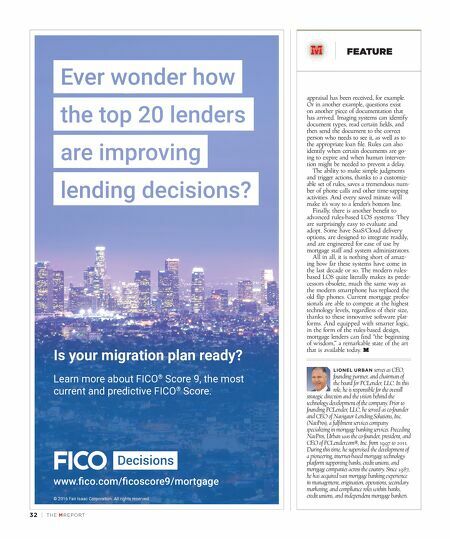 32 | TH E M R EP O RT FEATURE www.fico.com/ficoscore9/mortgage © 2016 Fair Isaac Corporation. All rights reserved. Is your migration plan ready? Learn more about FICO ® Score 9, the most current and predictive FICO ® Score. appraisal has been received, for example. Or in another example, questions exist on another piece of documentation that has arrived. 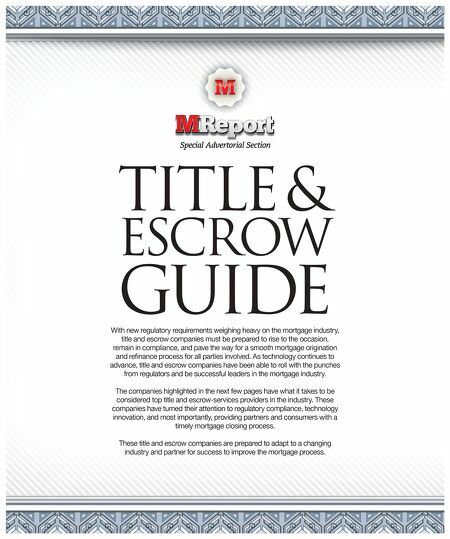 Imaging systems can identify document types, read certain fields, and then send the document to the correct person who needs to see it, as well as to the appropriate loan file. Rules can also identify when certain documents are go- ing to expire and when human interven- tion might be needed to prevent a delay. The ability to make simple judgments and trigger actions, thanks to a customiz- able set of rules, saves a tremendous num- ber of phone calls and other time-sapping activities. And every saved minute will make it's way to a lender's bottom line. Finally, there is another benefit to advanced rules-based LOS systems: They are surprisingly easy to evaluate and adopt. Some have SaaS/Cloud delivery options, are designed to integrate readily, and are engineered for ease of use by mortgage staff and system administrators. All in all, it is nothing short of amaz- ing how far these systems have come in the last decade or so. The modern rules- based LOS quite literally makes its prede- cessors obsolete, much the same way as the modern smartphone has replaced the old flip phones. Current mortgage profes- sionals are able to compete at the highest technology levels, regardless of their size, thanks to these innovative software plat- forms. And equipped with smarter logic, in the form of the rules-based design, mortgage lenders can find "the beginning of wisdom," a remarkable state of the art that is available today. LIONEL URBAN serves as CEO, founding partner, and chairman of the board for PCLender, LLC. In this role, he is responsible for the overall strategic direction and the vision behind the technology development of the company. Prior to founding PCLender, LLC, he served as co-founder and CEO of Navigator Lending Solutions, Inc. (NavPros), a fulfilment services company specializing in mortgage banking services. Preceding NavPros, Urban was the co-founder, president, and CEO of PCLender.com®, Inc. from 1997 to 2011. During this time, he supervised the development of a pioneering, internet-based mortgage technology platform supporting banks, credit unions, and mortgage companies across the country. Since 1987, he has acquired vast mortgage banking experience in management, origination, operations, secondary marketing, and compliance roles within banks, credit unions, and independent mortgage bankers.